Baseball has never really managed to ingratiate itself into the hearts of European sports fans. The long games often put fans off and the fact that the coveted World Series of Baseball consists entirely of American teams has never gone over well worldwide. 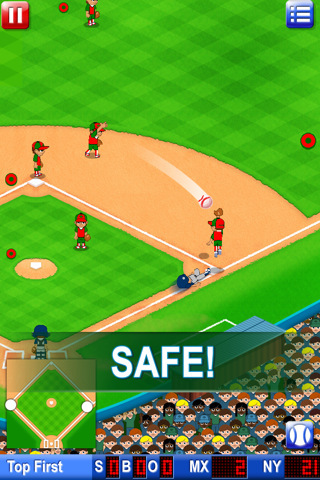 So what can we expect from the latest iOS title from Square-Enix, Big Hit Baseball? GRAPHICS: Upon your first glance of the game you will likely be far from impressed. The graphics are 2D sprites, in the same vein as something like Sensible Soccer. The people are cute, short and squat, each player only differing from one another in skin colour and uniform design. The pitch and stadium are also very basic and the crowd is as flat and lifeless as a crowd can be. Sprite animations are also very simple, with only a few different frames in each movement, but at the size the characters are rendered, this is not really a problem. Menus and trophies are clear and concise, without any bells and whistles and are perfectly functional, and in general, although the graphics are basic and unimpressive, they are as detailed as necessary for the game. The premise is simple and the rules are basic. The game is more or less designed as a showcase for the touch-screen control method and in this case visuals seem unimportant. They work well for the purpose intended and are charming, in a retro kind-of-way. Last time I made a grand slam...actually, never mind! SOUND: Sounds too, are pretty basic. There is some very American baseball organ music implemented upon startup, which fits the theme well, aside from that only the expected sound effects are used. Basic hitting and swooshing noises are included, along with some crowd celebration effects, which are reserved for Home Runs and similar occasions. The majority of the game is silent aside from this, which is no bad thing. The sounds used are perfectly functional, but nothing to write home about. GAMEPLAY: To start off with, due to the nature of iOS games it is obvious to expect that the developers wouldn’t try to put together a detailed, in-depth simulation of the sport. Taking an arcade style or casual approach will encourage both fans, and those who never appreciated the sport to take a chance on this release. In fact, Square-Enix themselves quote in their press releases for the game the “frantic” style of play. To initiate users, the game includes six short tutorial or training modes that will help players quickly get the hang of the controls and mechanics of play. These cover the three areas of control in the game; batting, pitching and fielding. Batting consists of simply swiping your finger across the screen. Fast swipes will result in harder hits. Swipe early for high hits or late for low shots. You can even swipe downwards for a defensive bunt shot. All fairly straightforward and intuitive, but it can take some time to master the timing required to hit a Home Run out of the park. There is also a fine art in loading your bases. In other words – for those unsure of the phrase – playing weaker shots until you have runners on all three bases, before going for the Home Run hit with the fourth man, in order to score 4 points in one shot. Pitching is slightly more complex than batting. You can throw a wide variety of different pitches by varying your finger swipes. Short swipes pitch low, longer swipes will fly higher. Fast and slow swipes do vary the speed greatly as well. Curve balls are performed by swiping in an arc. The bigger the curve of your swipe, the more curve on the pitch. This does allow for a fairly accurate reproduction of some of the different pitches you might come across in a real-life game of baseball. Wallop! That's a Baseball term right? Fielding is a much more straightforward affair, running and positioning is all handled automatically, as is throwing back to base. The only thing the player must consider is making catches. A simple swipe in the direction of the ball when a fielder is nearby will result in them jumping or making a dive to get the ball before it hits the ground. Tapping will attempt a catch without the acrobatics when an easier delivery is approaching. LONGEVITY: To further counter the arcade image, there is some real depth involved in the game too. 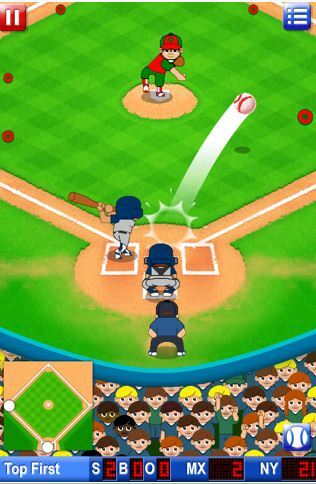 Big Hit Baseball features a total of three cup tournaments and 20 different teams. They have even included some non-USA teams such as Tokyo and Cuba. Ok, the teams are not 100% authentic, nor do they include real player names, but this is offset by the incorporated name editor. Being made by the same developers who worked on the iOS version of Championship Manager, gamers would expect the game to be fairly in-depth and customisable, and with the included statistics and editing tools, there is plenty here to keep you happy. The different cup competitions run at three difficulty levels, allowing for progression as the player gets the hang of the game and improves. 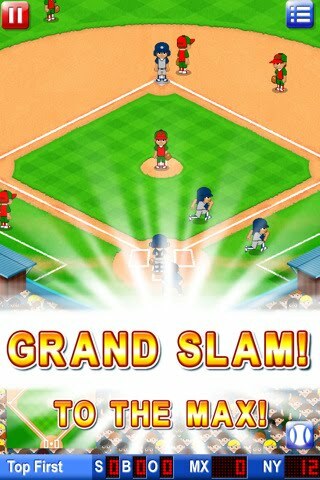 It does get particularly tricky to strike out or catch your opponent’s hits in later games, so mastering and winning all the trophies in the game will take quite some time. Add into the mix achievements and leaderboards supplied via Game Center support and there is a lot for the player to strive towards. Facebook integration is also included so that all of your achievements and biggest victories can be shared and gloated over with friends. A lack of any form of multiplayer is a bit of a let-down though. A sports title such as this seems to lend itself directly to competitive play, and Wi-fi multiplayer functionality would add a great deal of excitement and replayability into the mix. Putting your pitching and batting skills to the test against another human would be fun to try, as the timing and variety in play would be far more unpredictable. VERDICT: With its easy to pick up, yet harder to master controls and its sliding scale of difficulty when progressing through tournaments, the game provides an even and rewarding experience. It never feels like you are out of your depth as the game seems to naturally progress as you do. It will remain very much a like it or hate it game in some respects, as Baseball remains a niche interest. Even non-fans should definitely be encouraged to give it a fair chance. The visuals and sound may well be simple, but it is the control implementation which is key here, and the intuitive system that anyone could imagine creating in a game, but few could put in place effectively, really hits a Home Run.